• Hot forming lines (Press-hardening Lines) with linear manipulators ensuring high rates of productivity in the manufacture of structural parts of vehicles such as A and B pillars and sills. • Thermoplastic Forming and Composites Lines with active control systems to ensure parallelism, peripheral flow, and resin impregnation of the fibers in the molding and curing. 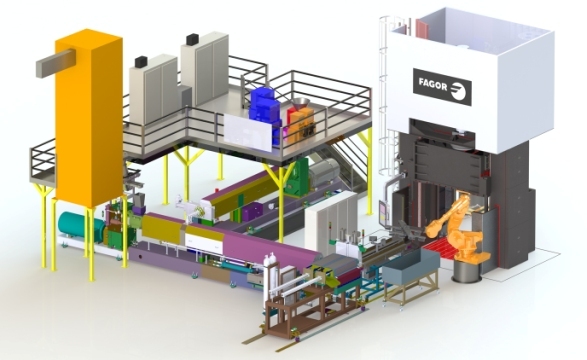 • Extension of the servo-technology SPT of FAGOR ARRASATE throughout the full range of mechanical presses, ensuring productivity thanks to its flexibility, adaptation and implementation process of innovative energy management systems. • Hydraulic presses of high efficiency and accuracy by the use of CNC controlled drives and hydraulic servo-groups. • Processing lines and rolling metal strip (Rolling & Processing); galvanized coating, skin pass, flattened and / or laminate, leaving the band ready for subsequent cutting and processing. • High performance cutting lines (Finishing lines) especially designed for cutting , stacking and / or packaging formats or coils of steel, aluminum, nickel or other metals considering the particularities of each of the materials. • Special mention of hybrid lines that can process and cut different types of materials in the same installation, such as servo-blanking steel / aluminum for automotive (Dual Servo-blanking Lines). FAGOR ARRASATE, industry leader and first nationwide manufacturer of machine tools, continues to work on developing solutions and innovations permitting the success of our clients in their development plans and growth worldwide.